"Iceboxes on wheels! Iceboxes on wheels!" Orin Nordholm, Jr. (Paul Muni) declares, gripping a model train and frantically running it up and down a track with all his might. After the bankers have turned down his original idea that he offered them a chance to invest in, that of freezing meat to be shipped in steel rail cars, it is Nordholm's assistant, Fred (Wallis Clark), who inadvertently blurts out the idea he really needed. Iceboxes on wheels were such a hit that by 1893 Chicago tour guides pointed out Nordholm house and declared him "Meat king of the world." If there's anything I love as much as a good entrepreneurial story it's a multigenerational saga and First National's The World Changes brings us both. We open in the vast emptiness of the Dakota Territory, 1856, as the Nordholms, Anna (Aline MacMahon) and Orin (Henry O'Neill), choose their place to settle, Orin adding the prayer "Praise God, here may we live and prosper." We close on that same land in 1929, called Orinville, with Anna and her only worthy descendants offering that same prayer. After Anna and Orin come three more generations of Nordholms with the focus of The World Changes on Orin, Jr., played in all phases of life by Paul Muni. The entertaining earliest portion of the film finds the Nordholms establishing what would come to be called Orinville, named after junior, not senior, a settlement so far out of the way that when Custer (Clay Clement) arrives in 1865 to announce, "Folks, the war's over," Anna Nordholm gives him a strange look and asks, "What war?" Turns out, to Lt. Col. Custer's bemusement, the Orinvillians haven't heard of either General Grant or Abraham Lincoln either. They're completely isolated in their own world with their own lives. "We have nothing to do with that," Anna says. "We have our own troubles." Time passes, telegraph lines spring up, railroad track is laid and Orin, Jr., grows up to be blonde-haired Paul Muni, looking every bit like a mid-1980's Bruce Willis. As settled as mother Anna is in Orinville, she's alarmed when a stranger, who turns out to be Buffalo Bill Cody (Douglass Dumbrille), gets Orin, Jr. excited about driving steer north to supply beef to the growing cities. Orin's supposed to stay in the town named after him, settle down with land and Selma (Jean Muir), the daughter of Orinville's second family, the Petersons. Orin, Sr. tells his wife, "The thing that brought us here, all of us, is the same thing that's driving him," but Anna says no, "He's after something else." His parents had their land to conquer, but Orin, Jr.'s sense of adventure needs to drive those steer. Muni as Young Orin, Jr. The Nordholm family quest is shown to be less pure as time passes by. The original Nordholms, Orin, Sr. and Anna, were purest, simply looking to tame the land and carve out a life on it. Upon arriving in what would become Orinville, pregnant Anna collapses to the ground and lets the dirt sift through her fingers. There's never been anything so American as conquest of land. Orin, Jr.'s drive is entrepreneurial in spirit: His parents gave him a comfortable home life, he wants to take it the next step. Anna is wary of Orin's quest for money. After James Clafflin (Guy Kibbee) talks Orin, Jr. into setting-up shop with him in Chicago because "It's a stampeding goldmine," Orin, Jr. repeats the line to his mother and Anna is disgusted that he wants to go "fight for money." But Selma, the girl who Orin, Jr. has pretty much been promised to since birth realizes that "He started something, now it's in him. It's eating at his blood." Once Orin, Jr. conquers capitalism what's left for his own children but a sense of entitlement that we see played out through the early 20th century from Richard Nordholm's (Donald Cook) seat on the New York Stock Exchange. Just as Anna had been repelled by Orin, Jr's quest for money, Orin, Jr. is disgusted by Richard's attraction to old money, which he eventually marries in the form of Jennifer Clinton (Margaret Lindsay). Of Richard's work on the Exchange Orin, Jr. tells him that it always seemed wrong to him. "There's no pride in it, no satisfaction. It's just gambling with a lot of money that belongs to cheap gamblers. And when they're through, you're through." Heaven help the fourth generation of Nordholm's, who we do see get to make their start. But it's Orin, Jr. who is the heart of The World Changes, the masquerading Muni playing him from 1877 through the film's close in 1929. (Uh oh, Stock Exchange, 1929, I think you know where that's going to go!). Once Orin, Jr. arrives in Chicago to work with Clafflin he quickly meets his partner's daughter, Ginny (Mary Astor), who's casting eyes at him right away. Prior to Orin's arriving in the office Ginny has been turning her nose up at the slaughterhouse outside causing her father to chuckle and say, "Ginny don't like the smell of our business, Orin." Orin should have heeded the warning! Orin and Ginny marry and set about being miserable together. At the dining table with their spoiled sons, Richard and John, Ginny explodes upon hearing Richard has been to the slaughterhouse: "Do you think you're going to make butchers of my sons?" Later she's excited to get the high-society Clintons to come to the house and plays matchmaker to Richard and Jennifer, but there's business going on as well as Orin makes sure that Ginny invites Hodgens (Sidney Toler), Morley (Oscar Apfel) and Krauss (William Burress), the biggest cattle and hog men in the country to the exclusive party. At the party Ginny takes it upon herself to announce Orin's retiring from the meat business to found an art gallery in Chicago. When Orin explodes Ginny snaps and Mary Astor begins a brief and ghastly performance that I'm surprised didn't earn her an Oscar nomination. "Butcher. Butcher. I smell blood. There's blood on you. Blood on your clothes. Blood! Blood!" While Gustavus Franklin Swift was born and raised in the East, he settled his business in Chicago where he became the man credited with being behind the invention of the "iceboxes on wheels" that made Orin Nordholm, Jr. of The World Changes a very wealthy man. Prior efforts at sending refrigerated meat were shown as Orin's failed attempts of freezing the actual meat, but in doing so ice was pressed directly against the meat and not only discolored it but affected the taste. Despite this failure Muni's desperate Nordholm pleads to the banker, Patten (Arthur Hohl), "I'm handing you the exclusive rights to an industrial revolution and you're throwing it away," but Patten will have none of it. A dejected Nordholm grits his teeth and says, "If I only had a heart like yours, Patten--I'd use it to freeze meat with." Andrew Chase, under Swift's employ, would devise the system whereby ice was packed at the top of a well-ventilated rail car allowing the cool air it created to flow down on top of the beef packed at the bottom of the car and keep the meat frozen on its journey. It worked, but just as it was portrayed in the film the bankers wouldn't get behind the innovation for fear that it would ruin the railroad industry in the short-term. Swift, like Nordholm, would have to finance the cars himself and he would actually fall victim to further complications from the actual rail lines which were not mentioned in The World Changes. The World Changes was a First National Picture distributed by Warner Brothers. It was based on a story called America Kneels by Sheridan Gibney and somewhat famously had it's named changed when Harry Warner said, and pardon this quote, that America Kneels sounds like "everybody in the country was either a Catholic or a goddamn queer" (Lawrence 186). It was the second film Paul Muni would complete under his Warner Brothers' contract following his previous success in I Am a Fugitive from a Chain Gang (1932). Chain Gang director Mervyn LeRoy was re-teamed with Muni for The World Changes. Muni was riding quite the crest at the time of The World Changes having just completed his extremely successful run in Counsellor-at-Law on Broadway in May 1933 and almost immediately boarding a train west with wife, Bella, to begin filming The World Changes in Burbank on July 12, 1933. 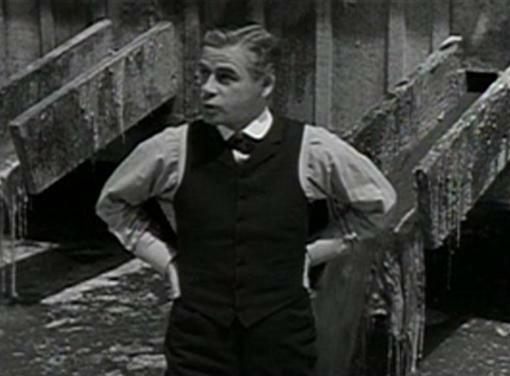 Paul Muni biographer Jerome Lawrence wrote of the film that "The World Changes had a near-epic quality, a combination of Cimarron and the later Citizen Kane" (187). I have been promising to write about The World Changes for awhile now and it was that Cimarron (1931) influence, and more directly Cimarron star Richard Dix's follow-up, The Conquerors (1932), which kept me from doing so. There's no doubt Cimarron's success was a major influence on both of those films, and that influence carried across so many years of story that even now, several months later, as I watched The World Changes once more I anticipated scenes that were actually in The Conquerors--blame Guy Kibbee, I guess, who's in both films. As surprised as I was by Oscar's snub of Mary Astor, I'm equally surprised that Muni didn't get a nod. Having previously been nominated for The Valiant (1929) in 1930, this may have been the fault of the Academy calendar at that time as the superior I Am a Fugitive from a Chain Gang, released in November 1932, didn't receive its nomination until the 1934 Awards, the same year that The World Changes would have been eligible. Also, perhaps, that Cimarron influence could have been at play. Maybe The World Changes was too similar, though that shouldn't have had any influence on judging Muni's performance. As for that performance Lawrence quotes the film's cinematographer, Tony Gaudio, who'd win an Oscar himself in 1937 for his work on Anthony Adverse (1936), as having said to Muni, "I'll tell you something: Muni isn't in the last twenty minutes of the picture at all. He disappears completely. It's all that old man. Nordholm. He steals the whole picture. Nobody knows that you're playing him." (189). While Muni and the film alike were praised upon its release, Lawrence notes that it was considered similar to an Edward G. Robinson film, I Loved a Woman (1933), in release at the same time and that "Both films unfortunately disappeared into the hungry mouth of block booking and have been forgotten." Muni dominates the film leaving a wealth of other actors to sweep in and out of the 73 years covered by The World Changes. Of those Astor is champ. Aline MacMahon can honestly be a bit grating playing Muni's mother, Anna, but I have a feeling her folksy performance suffers more today than it did during original release. Also, her part as the good woman adds balance to a movie whose other main female characters, those portrayed by Mary Astor and Margaret Lindsay, are cold and motivated only by money and status. Donald Cook is fine is Muni's son, Richard, and Gordon Westcott is a hoot as his more spoiled, Oxford educated/British accented son, John. Margaret Lindsay is a perfect block of ice as Cook's wife from old money, Jennifer, who prefers her Clinton name to that of the Nordholms, a bunch of peasant farmers in her eyes. Guy Kibbee and William Janney are both worth a mention as well for standing out some amongst the huge cast. Janney plays Muni's grandson and namesake, Orin Nordholm III. Jean Muir makes her film debut with The World Changes' only dual role, that of Selma Peterson and her granddaughter of the same name. Other familiar faces on the scene are legion: Patricia Ellis, Alan Dinehart, Henry O'Neill, silent star Anna Q. Nilsson, Arthur Hohl, Alan Mowbray, and even a few lines for 12-year-old Mickey Rooney at the beginning of the movie. Michael B. Druxman quotes the critics in his Paul Muni: His Life and His Films . Variety said "Muni has turned in masterly performance" and calls the movie "a cavalcade of American pioneering that majestically paints a celluloid record of the Nordholm family." The New York Times says of Muni that "his performance always enhances the scenes in which he appears," which is most of them. The Times praised the early scenes saying they were "depicted with grand effect. They possess a stirring quality," but adds that "the up-to-date melodramatic episodes, however, are too lurid, too extravagant and too forced to be persuasive" (125). While Lawrence's Citizen Kane comparison is a bit over-the-top beyond the scope of each saga, The World Changes is superior to Oscar-winning Cimarron. Paul Muni is at the top of his game here coming off the success of the very different characters he'd played in Scarface and I Am a Fugitive from a Chain Gang. Unfortunately The World Changes has never been released on video in any format to my knowledge, though there's always hope going forward from Warner Archive. At this time we'll just have to watch and wait for Turner Classic Movies to air it once again. The World Changes provides interesting history, a sweep through time and masterful acting from one of Golden Age Hollywood's most respected actors. It deserves rediscovery. Hollywood is full of people who had “left the farm,” now they preach to us, West is Best! Don’t leave the farm! Thanks, Steven. I love these type of epic stories on film. Yes, definitely a movie “messaging” over the Crash in response to the Depression, but with a structure hoping to piggyback the success of Cimarron a couple years earlier. It’s shaky, but better than its rep, especially for people who are already accustomed to movies of the period. For me, it helps that I’m a huge Richard Dix fan. The later one looks like a tough one to watch. I’ve tried a couple of times and haven’t gotten too far.